Computer-aided design technology to design ultrasonic tooling. Design, manufacturing, and testing phases are meticulously documented. Structural and material data are stored for easy retrieval, review, and modification, if necessary. Finite Element Analysis lets an ultrasonic tooling engineer simulate a horn's performance before it is manufactured. Experience-enriched staff improves existing designs and investigates new ones via the latest technology tools and rigorous testing. Ultrasonic tooling (i.e., horns and fixtures) is a critical element in the plastics assembly process. Ultrasonic horns and fixtures must be designed to accommodate the requirements of a particular application. Applying the practices of a documented work process, Dukane’s highly skilled ultrasonic tooling engineers use the latest technology to design and manufacture durable, dependable horns and fixtures that can be used with Dukane plastics assembly equipment, as well as competitive equipment. 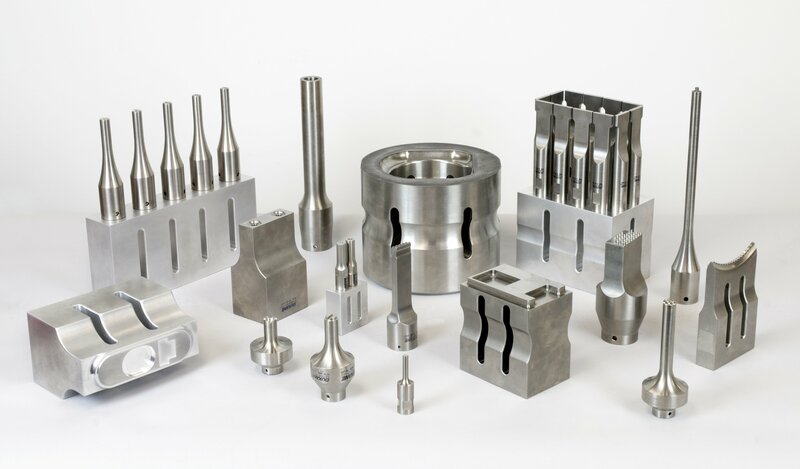 Ultrasonic tooling engineers consider factors related to materials, engineering, and labor in the early design stage. Application specifics such as size, shape, material, function, etc., are all evaluated. Experienced team of application and tooling engineers for rapid response. Captive world class machine centers to control quality and delivery. Latest in lab equipment for tooling inspection and testing. PDM system ensures repeat tooling is accurate and reduces delivery.